A wavefront sensor is part of adaptive optics and is a device which is used for measuring the aberrations of an optical wavefront. Wavefront sensors play an important role in evaluating the wavefront with enough spatial resolution and suitable speed for real time compensation. Globally, increasing R&D activities in the field of adaptive optics and increasing demand from the defense sector is expected to remain the key growth driver during the period of study. Geographically, North America dominated the wavefront sensor market driven by extensive utilization of this technology in sectors such as astronomy, defense and security, ophthalmology and laser eye surgery. North America was followed by Europe and Asia-Pacific as second and third largest market for the wavefront sensor market. Asia Pacific is projected to have the fastest growth driven by significant rise in research and development activities and technical improvements related to use of adaptive optic technology in a number of applications in developing nations such as China and India in this region. This report identifies the wavefront sensor market size for the years 2014-2016, and forecast of the same till the year 2022. 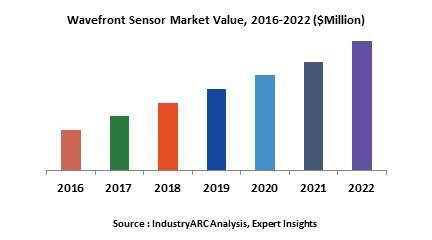 It also highlights the market drivers, restraints, growth indicators, challenges, and other key aspects with respect to the wavefront sensor market.